Riesling T-shirt - Apathynow & Vindal - Design, Illustration, Murals, Wine design and wine t-shirts. Riesling is so darned expressive whether Mosel, Pfalz, Alsace, Eden Valley or travelling elsewhere...a bit like Kraftwerk. 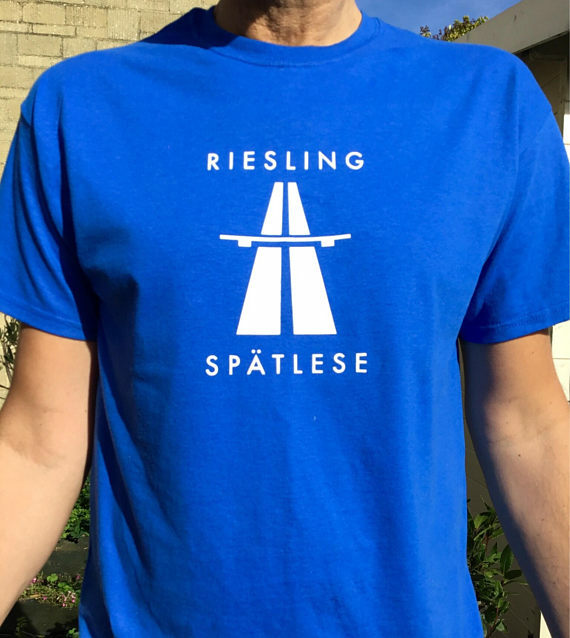 Royal Blue quality cotton Riesling wine t shirt with unique design: Riesling Kraftwerk Autobahn album cover. DRINK RIESLING! Unisex Heavy cotton style T-shirt and women's soft style ring spun t-shirt style also available. Flock Vinyl design. Model with 43" chest wears a Large. Tip: measure a favourite t-shirt under the arms and compare against the actual t-shirt measurements on the chart shown. The Women's t-shirts are a more fitted style; if in doubt order next size up. Care: Wash and tumble dry inside out on a low/medium setting. Gently iron on reverse of design.